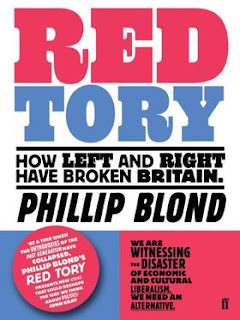 Blond's solution to the ever-deepening British malaise comes in the form of four imperatives: we must restore virtue to public life and discourse (calling for a new "high mass culture" in place of the inane mediocrity of the commercial media, and a recovery of John Reith's understanding of the BBC's vocation as providing "equal access to all things great"); we must re-moralise the market (placing capitalism at the service of the common good by embedding it in society); we must re-localise the economy (through such things as community land trusts and cooperatives); and we must re-capitalise the poor (through the provision, not simply of welfare, but of increasing scales of property ownership). The "separation of church and state" designates the state's monopoly on coercive violence. This is quite distinct from the question of the relation between theology and politics. Every coherent political philosophy already presupposes a theology, since it embodies a particular vision of what constitutes a good society. If these "theological" questions became explicit instead of covert – i.e., if we could actually have a debate about what a good society ought to look like – so much the better.